Tastes Like Travel arrived at the Dead Dog Saloon in Murrells Inlet on a Sunday afternoon. There was a lot happening as next door was a fish taco competition, hula dancing and lots of beer drinking. but not necessarily all three at the same time. We mingled with the friendly locals and then headed to the Dead Dog for some food and a Martini….or two. 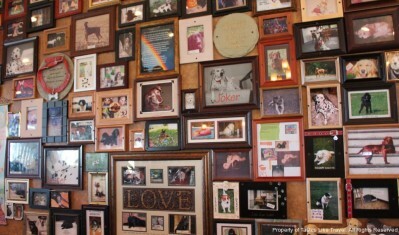 As we walked in the door there were hundreds of pictures of man’s best friends on the wall with dates on them. It took a while to figure out, but this was a tribute to people’s dogs that have gone on to the big bone-yard in the sky. This is the theme of the Dead Dog Saloon. So we were seated outside along the board walk facing the marsh. Since the festivities were still going on next door there were plenty of people to watch as we drank our martinis and perused the menu. There is a variety of seafood and traditional bar dishes. The trophy wife was not particularly hungry so we decided to choose a few appetizers. We started with a dozen oysters on the half shell and they were fresh and good. They were not local oysters but came from the gulf coast region. They were tasty though. damn she was right. The soup did not have chunks of crab but it did have a good amount in it. The soup was creamy with a hint of sherry and was delicious. I tried some she crab soup at another restaurant later in the week and the Dead Dog Saloon was by far the best. If you go there you must try this soup. The martinis were pretty good too. The more we had the better they were. The place was full of locals and vacationers, the atmosphere was pleasant and warm, and the prices were reasonable. The service was low-key and the staff was friendly. The Dead Dog Saloon has live music most nights and is right on the main road. 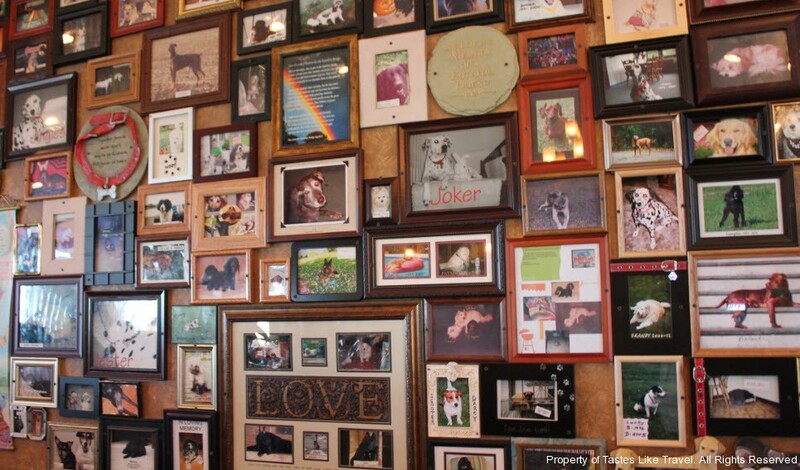 If you are ever in Murrells Inlet in South Carolina try the Dead Dog Saloon, and don’t forget to bring a picture of your deceased best friend. He will be in good company there. The food was delicious and fresh! I loved the theme. Making a restaurant that pays homage to Mans Best Friend. The fi rst trip to Seattle is always a culture shock for a Southern Man (sorry Neil Young). As we left the hotel and walked towards Pike Place Market I swear I could hear Nirvana in my head. We were hungry and by the time we walked the 6 blocks to the market we had 3 different referrals for a place to eat. Once we got in the market it became clear what our dinner would be. In the market vendors offer cups of this and samples of that so we decided that our dinner would be whatever we saw that we liked as we strolled through the Market area. My mind was reeling as as it took on sensory attacks of food, drink and the color Pikes Market had to offer. You can’t help but stop at every stand just to see what was offered and hear the merchants sing their Sirens song. The first food came from a seafood vendor ( I’m sorry I forgot the name as my mouth was watering from anticipation) who was offering cups of Dungeness Crab cocktail. 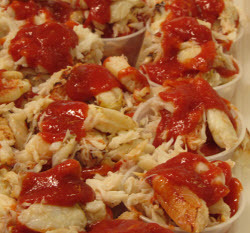 For $7 you get a cup of fresh crab with lemon and hot sauce. I could have stood there all night, but we moved on. As night approached (at 4:45 I might add) the sounds of music came from virtually every street corner. The original Starbucks had musicians waiting in line to perform with their guitar cases and tip jars begging for dollar bills. You could literally hear music from 3 directions at once. We wandered in an alley across from the market and came across Pike Place Chowder. 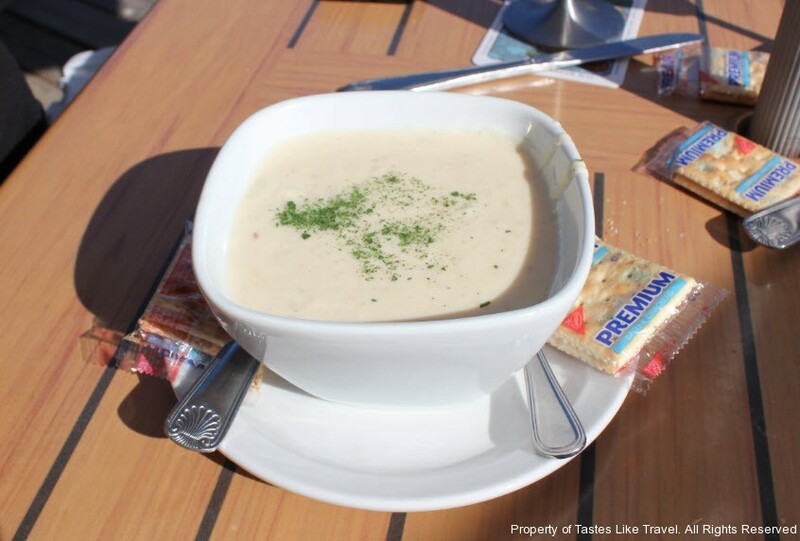 I love clam chowder and I thought I had tasted some good chowder before. WRONG. Pike Place Chowder boasted it’s award winning recipes. I had the champion chowder and my wife had the seafood bisque. I should use expletives here as with out a doubt both were the best we had ever had. Rich and meaty and with ingredients that made this dish far and above anything I have ever tasted. If you are in Seattle this is a must eat place. It was time for a drink. We walked back through the market and settled into the Athenian Seafood Restaurant and Bar. It was happy hour (lucky us) and with a purchase of a drink you are eligible for a discounted appetizer. One drink, one appetizer – interesting concept! I had a martini and my better half ordered wine and then we had the waitress bring us some oysters on the half and fried calamari with Jalapeno Aioli sauce. For you southerners the oysters in the Northwest are slightly different that the gulf oysters we are used too. They have a stronger seafood taste, less of a salt taste and are slightly smaller. But still worth having if you are an oyster nut. The Calamari was obviously homemade and had a much better taste than the frozen and fried we are used to. The view of the Seattle Harbor is spectacular and you can tell this place is favored by the locals. If you want a taste of Seattle then do the Dinner Stroll at Pike Place Market. You will find something you will like and have fun along the way. More coming from Tastesliketravel.com in Seattle.